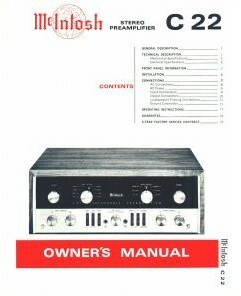 Here's a 15 page user's manual plus 6 pages of service data and schematics for the classic McIntosh C-22 vacuum tube stereo preamp. Please note: I'm selling the manuals, NOT the preamp! This is my own direct scan and remaster of the original manuals, NOT a 3rd or 4th generation copy! In Adobe pdf format, which can be printed, as well as 'zoomed' to examine fine details. Another advantage to pdf: no shipping costs! This (12MB) file can be downloaded the same day I receive payment!